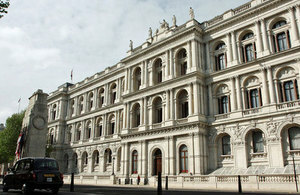 Foreign Secretary William Hague has condemned the bomb attack on the UN building in Abuja on 26 August. “I was shocked to hear of today’s bomb attack at the UN compound in Abuja. This brutal act has killed and injured many innocent people and I utterly condemn those who have carried it out. My thoughts are with the families, friends and colleagues of those affected. “Around the world the UN works for peace, security and international cooperation and an attack on the UN is an attack on these principles.